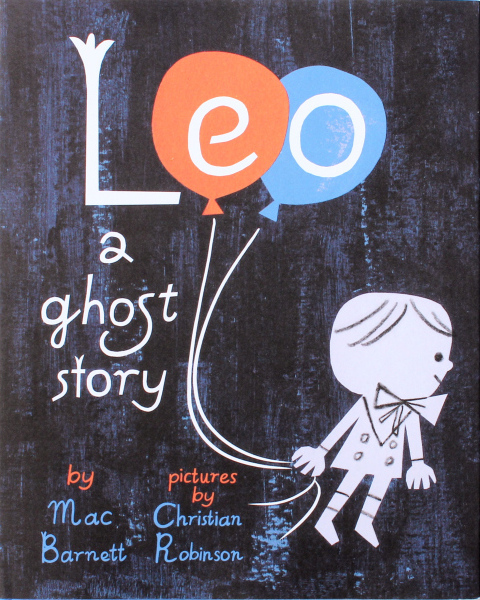 This rather amusing statement initiates a series of events in Leo: a Ghost Story (Mac Barnett and Christian Robinson/Chronicle Books) resulting in a young ghost-boy leaving his home and venturing far afield in search of a more welcoming abode. Young Leo is self-entertaining house ghost occupying an old dwelling on the edge of the city. When a new family moves in, his friendly overtures are less than well received. The family calls in a scientist, a clergyman and a psychic to de-ghostify the house, which Leo believes is a waste of money. He knows he is unwanted. Leo says farewell to his home and ventures into the city. Judging by his Little Lord Fauntleroy attire, he is about a hundred years old, and the city looks very different to him. He is quickly lost in the bustling urban setting. The first person to ‘see’ Leo is a little girl named Jane, who invites him to play Knights of the Round Table. 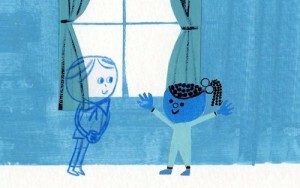 Jane takes Leo home, where both the girl and her parents assume he is imaginary. When Jane discovers he is a ghost, she’s pretty cool with it. In fact, she’s a pretty cool girl. Her games are imaginative and inclusive, and it’s wonderful to see her calmly accept Leo for who he is – a ghost in need of a friend. 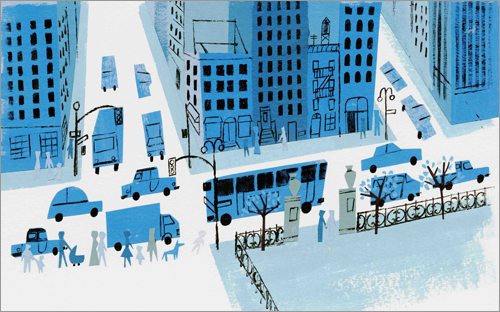 I am familiar with Mac Barnett of Sam and Dave Dig a Hole fame but had not heard of Christian Robinson until his name started popping up on the internet in gleeful anticipation of Leo: a Ghost Story. A previous winner of the Coretta Scott King Illustrator Honor for Josephine: the Dazzling Life of Josephine Baker, Robinson’s newest book retains the old-timey simplicity of form but introduces a minimalist and much bluer palette. The San Francisco-based artist uses acrylic paint and cut out construction paper to create his humourous and playful illustrations. Leo is a blue outline, but no less substantial than the rest of the characters – just a little more see-through. 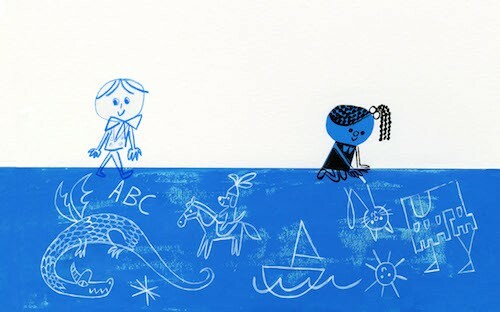 The use of varying shades of blue is a nice way to bring diversity to the page without being overt. Leo: a Ghost Story is also beautiful. The colours, though limited to blue, black, and orange (on the cover), are stark and chilly. A little haunted, but invitingly so. I’m with Jane on this one – I would share mint tea and honey toast anytime with Leo. 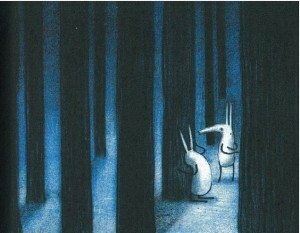 Published in 2014, the truly scary WHAT THERE IS BEFORE THERE IS ANYTHING THERE by the Argentine cartoonist Liniers. This beautifully illustrated book is wildly funny, and surprisingly disturbing. As a former scaredy-cat kid, I can relate to the lad’s nightmarish visitations when the lights go out. 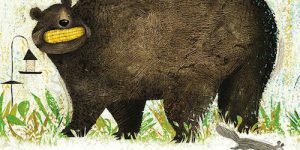 Liniers balances humour with creeptastic (and yet somehow affable) creatures that do nothing but stare at the boy – until the thing that is there before there is anything there arrives. Yikes! 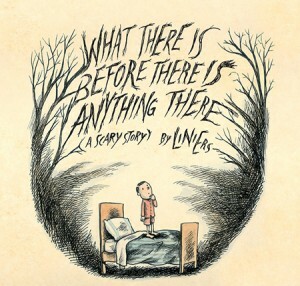 New For 2014, the truly scary WHAT THERE IS BEFORE THERE IS ANYTHING THERE by the Argentine cartoonist Liniers. This beautifully illustrated book is wildly funny, and surprisingly disturbing. As a former scaredy-cat kid, I can relate to the boys’ nightmarish visitations when the lights go out. 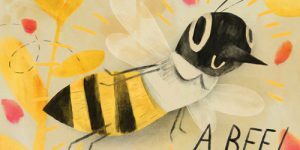 Liniers balances humour with creeptastic (and yet somehow affable) creatures that do nothing but stare at the boy – until the thing that is there before there is anything there arrives. Yikes! 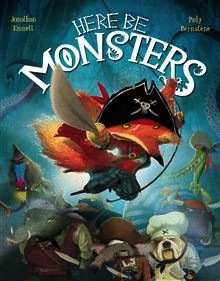 New for 2013 and fresh off the high seas, the wickedly funny HERE BE MONSTERS by the great Argentinian illustrator Poly Bernatene (swashbuckling rhymes by Jonathan Emmett.) Previous conspirators on The Santa Trap, this brilliant twosome have created a pirate tale like no other. Beware of hidden treasure folks, this beautiful and deadly tale of Captain Cut-Throat and his unfortunate crew will leave you laughing (and running for shore.) 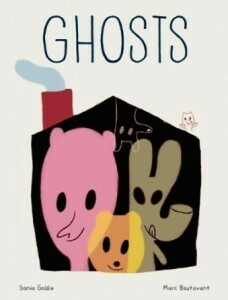 Arrrrrrr…..
Also new for 2013, the deliciously witty GHOSTS (Sonia Goldie/Marc Boutavant.) Courtesy of a couple of affable spooks, the record is finally set straight with regard to ghosts, specifically house ghosts. Apparently, we’ve been mislead. True ghosts inhabit every corner of our homes, and nary a one would be seen dead (well, you know) in a sheet, or utter a single ‘Boo.’ Boutavant’s gorgeously illustrated book is packed with every type of apparition; library ghosts, television ghosts, and of course, that big fellow who lives under your bed. Supernatural fun. 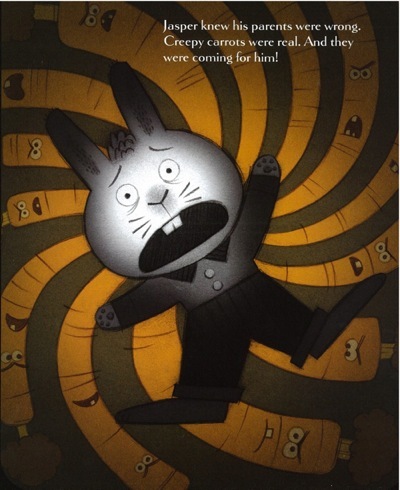 CREEPY CARROTS (Aaron Reynolds/Peter Brown, 2012)-Absolutely the best and most beautiful book on haunted root vegetables in print. Poor Jasper Rabbit, with his instatiable taste for carrots. Who will believe that he is being stalked and tormented by garden vegetables? Not his friends, not his parents. Jasper is forced to act alone, and his ingenious, and somewhat over the top solution may be the answer to more than one problem. THE INSOMNIACS (The Brothers Hilts, 2012)-An amazing discovery on the shelves of my local bookstore, The Insomniacs is not so much a Halloween story as an appreciation of all things that go bump in the night. The Insomniacs are a strange little family, recently displaced, who just can’t get their circadian rhythms to play nice, until…they discover the dark secrets of the world at night. Lots of quirky touches, like the star-gazer mother, the upside-down Humpty Dumpty father, and all the odd, nocturnal creatures that populate this unnamed town on the ocean. 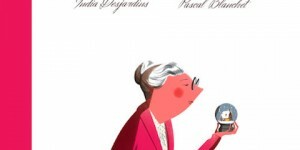 The Dead Family Diaz~P.J. Bracegirdle/Poly Bernatene (Dial, 2012)-No Halloween celebration is complete without at least one ghostly visitation from the great beyond, and in this sense, what could be more Halloween than El Día de los Muertos, or the Day of the Dead? Yes, it’s a Mexican festival, it’s celebrated on November 1, and no-one sits in a pumpkin patch waiting for the Great Pumpkin, but in both traditions, skeletons and other assorted dead folk roam the streets in search of a party. In The Dead Family Diaz, young Angelito Diaz is about to walk among the Living for the first time in his life, I mean, death, and he’s a little frightened. 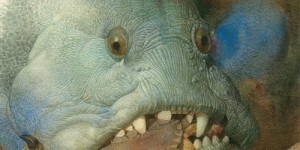 The living have ‘big red tongues and bulging eyes,’ his sister teases. Angelito meets a boy (of the living variety) named Pablo, and even though he calls Angelito a popsicle and tries to remove his skeleton ‘mask’, the gruesome twosome strike up a friendship. The Dead Family Diaz is another stunning example of the genius of Poly Bernatene, the Argentinian artist at the heart of When Night Didn’t Come, The Santa Trap, and 60+ other children’s books. Working digitally, his colours seem newly invented, with an inner luminescence that makes each page glow. 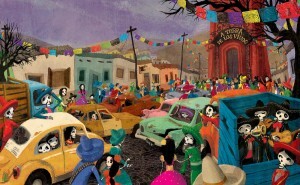 In The Dead Family Diaz, the candy-coloured swirl of cars, buildings, skeletons and sombreros mirrors the exuberance of the festival both in real life (or so I understand), and as written by P.J. Bracegirdle. While Bernatene takes us to a darker, stranger place in The Dead Family Diaz, the vividness of his palette remains, as does his ability to turn a visually chaotic scene into a beautifully balanced illustration. This is not to suggest that some of the artwork, especially the close-ups of the skeletal Angelito, are not disturbing; they are, but not overly so. 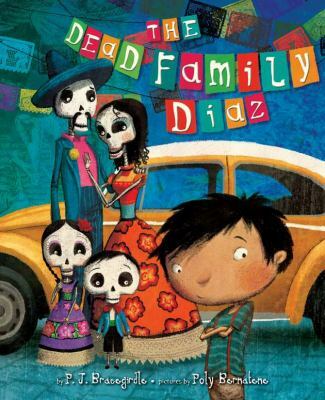 In word and image, The Dead Family Diaz is a celebration. THE MONSTERS’ MONSTER (Patrick McDonnell, 2012)-A sweet treat for Halloween. Don’t let the presence of Frankenstein fool you, this book is more about gratitude and friendship than terrorizing hapless villagers. 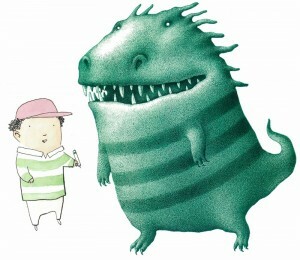 As Grouch, Grump and little Doom & Gloom discover, monsters do not always act as planned. From the artist who brought us the cartoon strip Mutts, and the perennial Christmas favourite-The Gift of Nothing, comes a most unusual, and funny tale of a kindly monster in search of…jelly doughnuts. Hmm. The newer edition of Scary Poems for Rotten Kids has a friendlier cover and interior illustrations that are far less sinister than the original black & white artwork by Anthony LeBaron. Presumably, this is an attempt on the part of the publisher to make O’Huigin’s nightmarish words more palatable to the modern child who is perhaps less rotten and a tad more sensitive than kids 25 years ago. 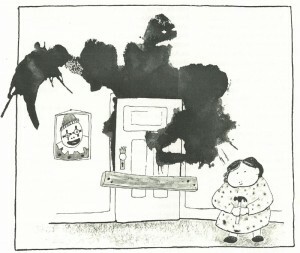 The cartoonish drawings are no match for LeBaron’s ink-stained malevolence. Wonderful. 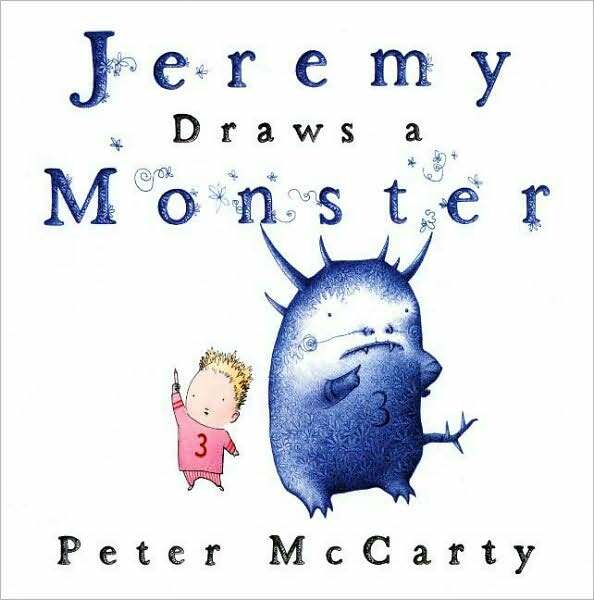 Jeremy Draws a Monster-Peter McCarty (Henry Holt 2009)-Like The Monsters’ Monster, there is nothing scary about this book, other than McCarty’s genius with a bit of ink and a coloured pencil. His finely detailed illustrations are so exquisite, I find myself staring at them in a (failed) attempt to decipher the secrets of his paintbox. In Jeremy Draws a Monster, an isolated and lonely kid draws himself a blue, horned beast for company. To Jeremy’s frustration, his new buddy is a bit of a nightmare, demanding all sorts of drawings to fufill his escalating list of monster comforts, including sandwiches, hotdogs, a soft chair, and finally, a big pink hat to wear ‘out on the town.’ When the monster returns, and takes over Jeremy’s bed, the worn out kid draws a bus and a bus ticket and bids farewell to his friend. While waving goodbye, Jeremy strikes up a conversation with the neighbour kids, who invite him over to play. Not particularly Halloweeny, but a beautifully illustrated paean to the power of imagination. The Monster Returns-Peter McCarty (Henry Holt, 2012) Uh oh, he’s baaack! This time, however, Jeremy is prepared. 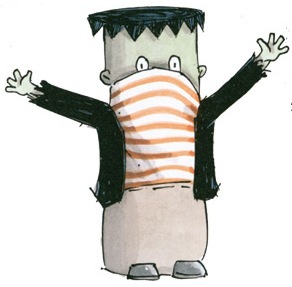 Our little artist enlists his friends to draw their own monsters as c0mpanions for his monster. Very clever, Jeremy. Incredibly, with all the colourful new beasts, this sequel to Jeremy Draws a Monster is even more beautiful than the original. 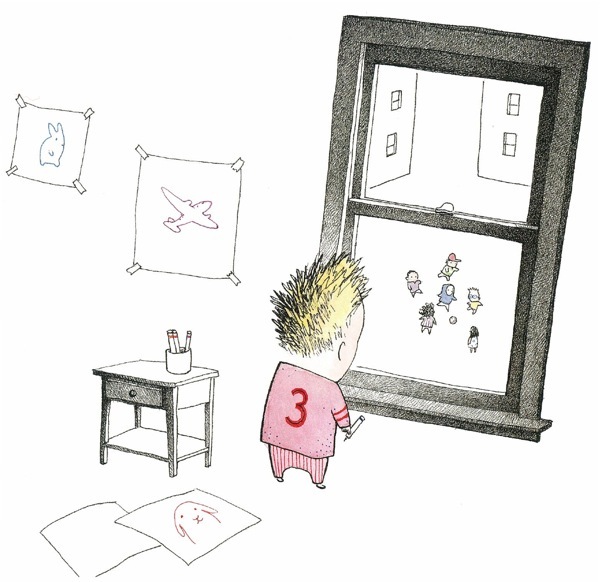 Lest you think Peter McCarty capable of only one style of illustration, check out Hondo and Fabian, one of my all-time favourite picture books. McCarty has a very elegant touch, with an eye for detail that is nonpareil. On a related note, I picked up The Monster Returns on September 15th, 2012. It is the last book I will ever purchase from Greenwood’s Bookshoppe, a local independent bookstore in the city that closed two weeks ago. Heartbreaking. 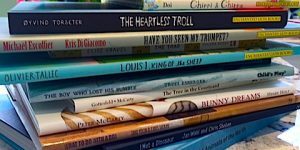 Such a great kids section, and many of books reviewed in this blog have come from Greenwood’s. 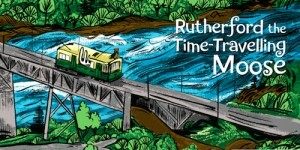 You will be missed, and thanks for all the great books!